I am sorry I am giving you this update very late. I have not been feeling fine, my eyes are white and I have been vomiting all day. Although I missed my period last month but am sure it’s just a headache that is making me feel like this. I just finished using paracetamol and am fully fine now. Abeg I was just joking o. Before my potential husband will say yes, Lola is pregnant and leave me here. So let’s go to the reason for this post. 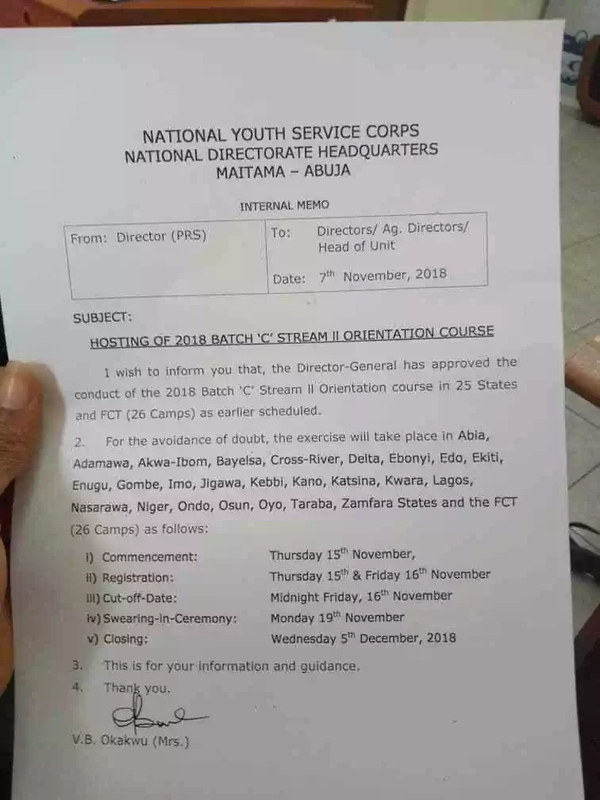 Due to some factors and some regrettable issues, the NYSC 2018 Batch C Orientation camp will not be able to hold in all the 36 states in Nigeria. these states below are the states that are safe and will be used for the NYSC 2018 batch C stream II orientation camp. Abia, Adamawa, Akwa-Ibom, Bayelsa, Cross River, Ebonyi, Edo, Ekiti, Enugu, Gombe, Imo, Jigawa, Kebbi, Kano, Katsina, Kwara, Lagos, Nasarawa, Niger, Ondo, Osun, Oyo, Taraba, Zamfara States and the FCT. You don’t have to panic if your state is not on the list, the address of the orientation camp you will attend will surely be one of these states. Pls why is ogun state excluded from the states listed above? Any problem with ogun state? Why are they so silent about Kaduna? I’m getting tired & frustrated with all of these. My friends and family are starting to think I’m the one not being serious with my service. Good morning, is it for real that stream 2 will be going to camp on the 15th of November? Thanks. Next year June for what? I was registered 4 stream l b4 but I can’t meet up with camp n which to go with stream ll. What can I do b4 registration close today? You know are supposed to have gotten an original. Have you gotten your evaluation letter from the ministry and uploaded it? Hello lola, I got reposted to kaduna again both from stream 1 and 2. But kaduna is not on the listed deployment state. Any update for me. Are they likely to change it. Oh… Maybe God have a plan for you in Kaduna o…Check the call-up letter, you will see the address of where your camp will hold. Your camp will hold in another camp.